This elegant and good size mustard pot was made by Henry Stratford and is dated London 1896. It is of conventional oval form with a reeded handle. The domed hinged lid with a shell thumb piece. Complete with blue glass liner. Sold with a mustard spoon by Francis Higgins also dated London 1897. Date letter "a" for 1897. Date letter "b" for 1897. Body in very good condition. Height up to finial: 7cm / 3 inches. Length: 10cm / 4 inches. Depth: 6cm / 2.2 inches. Weight excluding liner: 107 g / 3.8 oz. 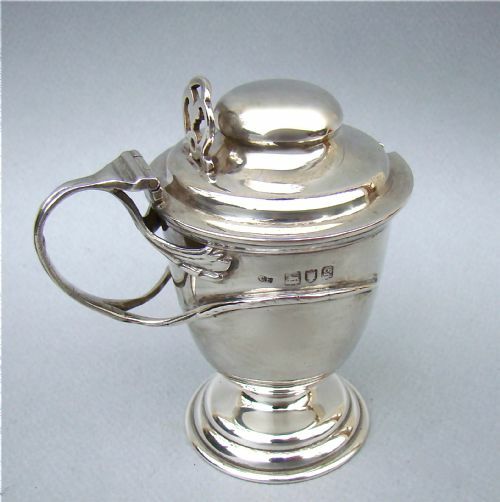 This exquisite solid silver mustard pot is hallmarked for Birmingham 1902. The cylindrical body pierced with foliate roundels. The domed hinged cover with shell thumb piece. Raised on four ball feet. Fitted with a blue glass liner. Date letter "c" for 1902. Height up to thumb piece: 6cm / 2.2 inches. Diameter: 4.5cm / 1.6 inches. 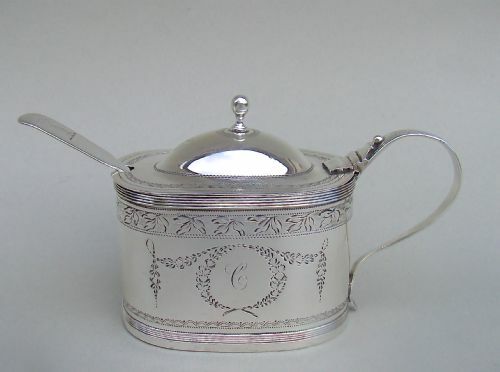 This is a very elegant and unusual silver plated on copper mustard pot dating circa 1830. Of oblong form, with a hinged concave lid and gadroon border. The back with scroll handle and the base raised on four splayed legs. 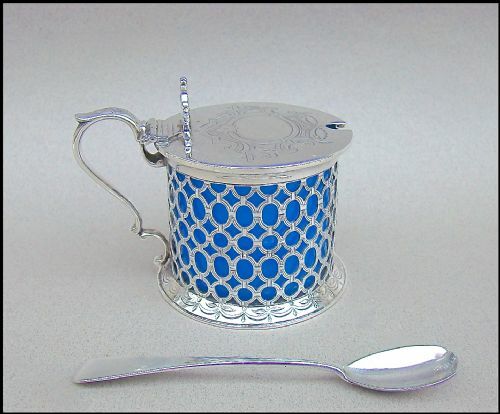 Sold with a silver plated mustard spoon. Copper showing through at places. Maximum Height: 7cm / 3 inches. Length: 7cm / 3 inches. Depth: 4.5cm / 2 inches. Postage overseas: from £10 Standard parcel. This fabulous and rather substantial solid silver mustard pot is hallmarked for London 1853 and bears the marks of the renowned Charles Thomas Fox & George Fox. The drum-shaped body exquisitely pierced with circular and oval patterns. The flat hinged cover engraved with strapwork decorations, very popular design at the time, and surmounted by a pierced fan-shaped thumbpiece. The shaped scroll handle and everted circular base both engraved with delicate swags. Fitted with a very unusual turquoise opaline glass liner, a very desirable colour. Sold with a Victorian silver mustard spoon dated London 1861. Date letter "S" for 1853. Height up to thumbpiece: 8.5cm / 3 inches. Diameter: 8.5cm / 3 inches. Weight excluding liner: 144 g / 5.1 oz. 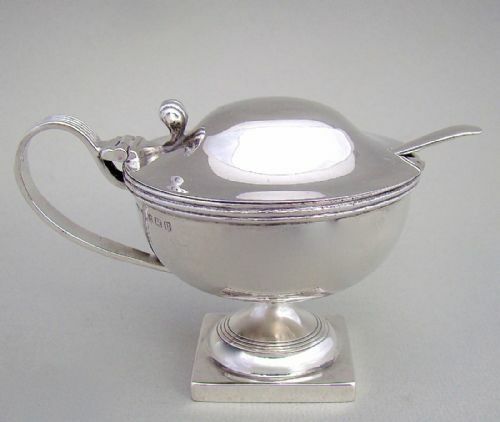 This wonderful Arts & Craft silver mustard pot was is dated London 1902 and was designed by the celebrated Charles Edwards, one of the main silversmiths of the Arts & Craft movement. The ovoid body mounted on a circular pedestal foot. The hinged domed cover with pierced thumb piece and bifurcated sinuous handle terminating in stylised leaves. Fitted with original blue glass liner. Date letter "g" for 1902.
height: 8cm / 3.2 inches. Diameter at base: 4cm / 1.6 inches. This elegant and good size mustard pot was made by the reputed silversmith George Burrows and is dated London 1796. It is of conventional oval form with a reeded scroll handle. The domed hinged lid with conforming decorations and a silver ball finial. Monogrammed with the letter "C" on both sides and lid and engraved with an interesting personal inscription to the underside. Date letter "A" for 1796. Height up to finial: 8cm / 3 inches. Length: 11cm / 4 inches. Depth: 5cm / 2 inches. Weight excluding liner: 101 g / 4.8 oz. 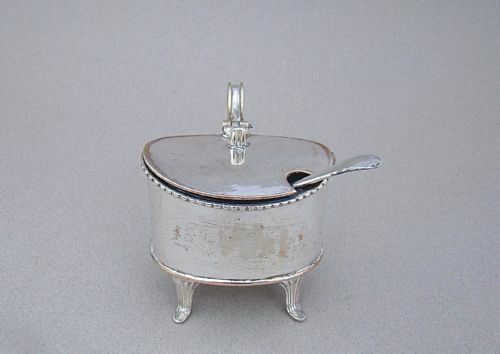 This fabulous silver mounted mustard pot was made by important silversmiths. George and Charles Thomas Fox come from an illustrious silversmith family and their pieces are very sought-after. The thumb-cut glass body of baluster form. Mounted with a hinged lid engraved with strap-work decorations. Unusual thumb-piece and scroll handle. Sold with a Victorian mustard spoon by George Adams. The spoon is Fiddle pattern with a gilt bowl and initialled handle. GF over CTF for George Fox & Charels Thomas Fox. Date letter "n" for 1848. Date letter "u" for 1835. Height up to finial: 7.5cm / 3 inches. Diameter at widest: 8cm / 3.2 inches. 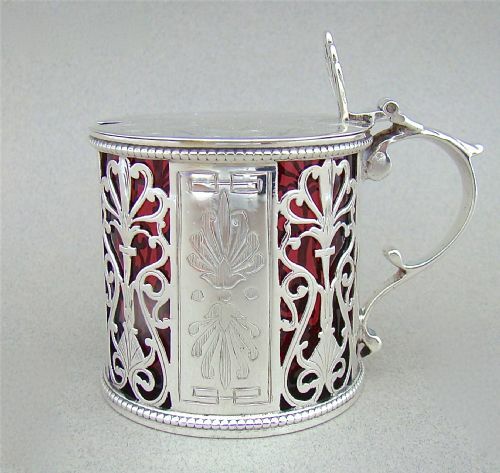 This fine solid silver mustard pot is hallmarked for London 1875. The drum-shaped body with alternate bands of elaborate pierced decorations and engraved panels. The flat hinged cover engraved with conforming decorations and surmounted by a pierced fan-shaped thumb piece. Shaped scroll handle and fine beaded borders on base and rim. Fitted with a cranberry glass liner, always a very desirable colour. A bit obscured but most probably EB over JB for Edward & John Barnard. Date letter "u" for 1875. Good hinge with just a little sideway movement. Height up to thumbpiece: 7cm / 2.6 inches. Diameter: 6cm / 2.4 inches. Weight excluding liner: 89 g / 3.2 oz. 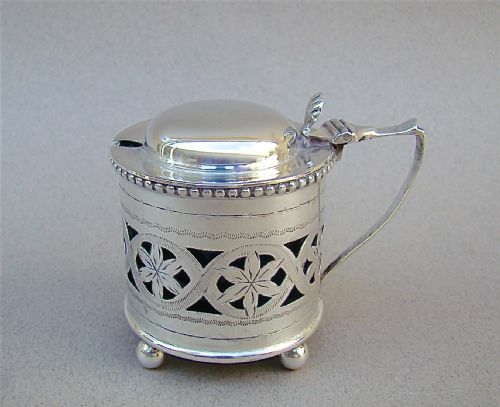 This elegant solid silver mustard pot is very much in the Georgian revival style. The vase shaped body with domed hinged cover and reeded handle. Raised on a square pedestal foot. Fitted with the original blue glass liner. 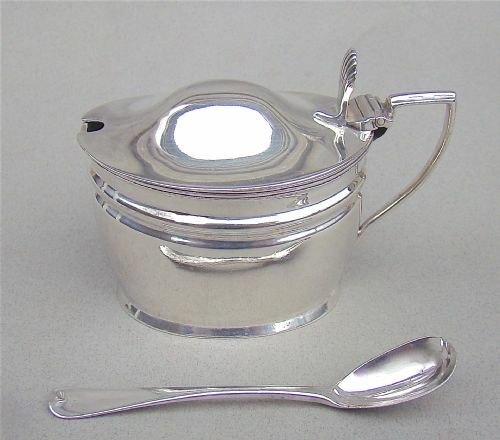 Sold with an associated solid silver mustard spoon by William Hutton & Sons and dated Sheffield 1925. SB &S Ld for S Blanckensee & Sons Ltd. Date letter "U" for 1917. Height: 7cm / 2.6 inches. 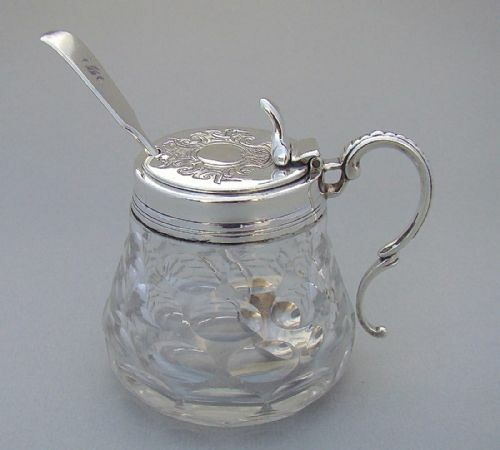 This exquisite solid silver mustard pot is hallmarked for London 1869. The cylindrical body pierced with vertical slatsand elliptical borders. Flat hinged covers engraved with a crest and surmounted by a pretty pierced thumb piece.
" M. B. R .
Date letter "d" for 1869. Skilful old repair on three small sections of the slats just behind the handle, they are barely noticeable as they are hidden by the handle and are mentioned for accuracy and reflected in the price. Weight excluding liner: 99 g / 3.5 oz. 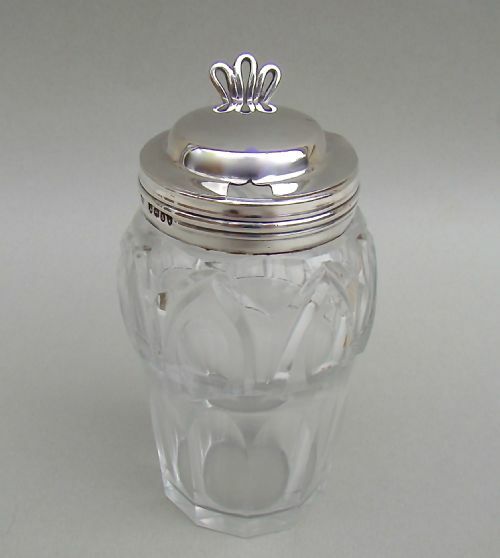 This simple and elegant silver mounted cut glass dry mustard jar is dated London 1833 and was made by the prolific Samuel Roberts. The tall baluster glass body sliced-cut with geometric patterns and mounted with a simple silver domed hinged lid. 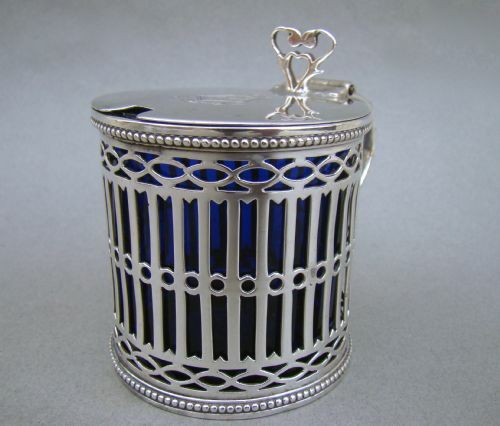 The hallmarked silver neck with reeded decorations, the lid with a distinctive wirework thumb piece. Date letter "s" for 1833. Height: 11cm / 4.2 inches. Diameter at widest: 6cm / 2 inches. Postage UK: £5 Recorded delivery 1st class. 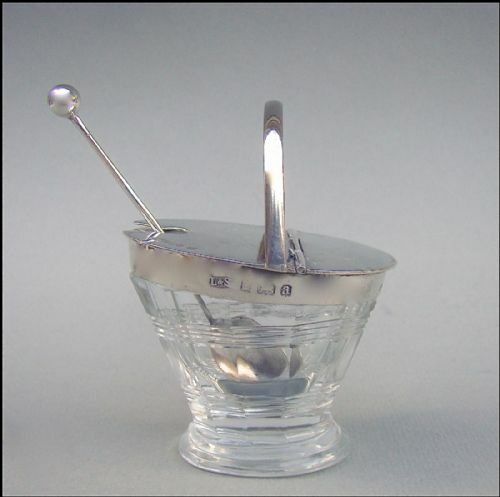 This unusual and amusing silver mounted glass mustard pot was made by Levi & Salaman and is dated Birmingham 1900. The tapered cut glass body with a flat hinged lid is modelled on a coal scuttle. The handle is used to lift the lid. It comes with an associated silver mustard spoon dated Birmingham 1911. L&S for Levi & Salaman. Date letter "a" for 1900. Width: 5.5cm / 2 inches.